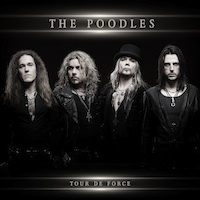 The Poodles from Sweden is one of these bands that always deliver high quality hard rock. Samuel Jakobsson is born with one of the best hard rock voices in the genre. He was a drummer in the amazing band Talisman before he took over the microphone-stand in The Poodles. Where he managed to contribute and create a story of success that just seems to continue. Their purebred melodic hard rock does not surprise me anymore. Nowadays, I expect that they will deliver a disc with ultraclean and powerful vocal performance and charming guitars in entertaining melodies that are very catchy. Half-way into the album, all my eventual doubts are totally vanished. This is one of their strongest albums, if not their absolute most complete disc ever. 'Tour de Force' has several songs that sounds both tougher and rougher than on previous productions. Meanwhile the radio-friendly rock songs that should appeal the faithful Poodle fans are of course also represented. 'Tour de Force' contains hard, powerful, technical metal songs and emotional, beautiful melodic rock ballads and they are all packed in a top-notch production. This is their seventh studio album and they continue to walk into a more mature and heavy hard rock. It feels like they have found a stability and harmony in the band, which feels straight through all thirteen tracks. It swings of joy and it is quivering of rock harmonies. The bonus track is the official Swedish team song for the 2013 World Championships of Ice Hockey, "En För Alla Alla För En"! My personal experience when I've seen The Poodles on stage is that they are a very entertaining and colourful live band and I hope that I'll have a opportunity to see them again soon.